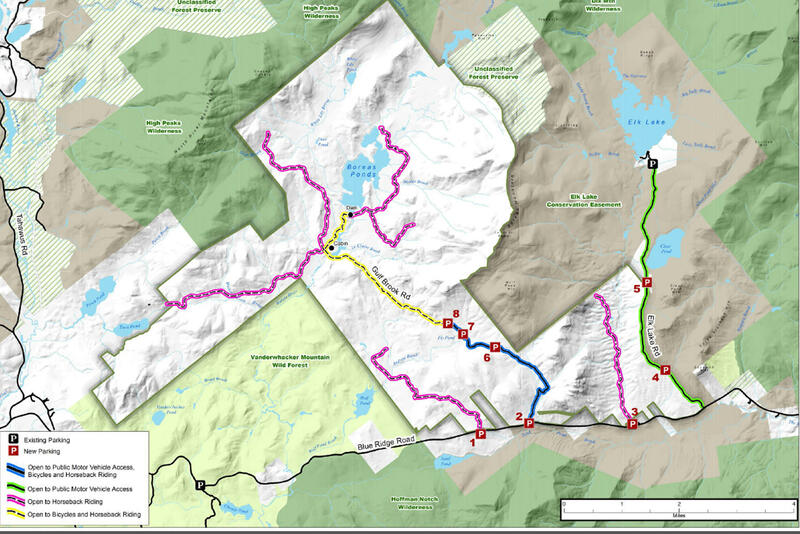 The Interim Access Plan for the Boreas Ponds Tract allows just over 3 miles of motor vehicle access on the Gulf Brook Road; opens over 6 miles of roads to bicycling from Blue Ridge Road to the Boreas Ponds Dam; and allows horse and horse drawn wagons on about 25 miles of seven roadways. Paddlers will have access to Boreas Pond and other waterways if they carry in their canoes. All of the lands are open to camping if the campsites are more than 150 feet from any roadway or body of water. The plan also outlines public parking areas.